Emotiva, a factory direct to user manufacturer, has recently released what appears to be a fantastic line up of cables. Our forum user RoadRunner6 has already purchased some.Â Follow his experiance with these cables here. Here is some of their line up! Solid brass machined ends with 3 micron thick gold plating. Nylon braided anti-scuff jacket over PVC outer insulator. O ring seal between the body of the connector and the sleeve to keep out moisture and dust. 100% double shielding using a solid mylar wrap overlaid with tin-plated, oxygen-free copper braiding. Nylon insulated oxygen-free stranded copper core. 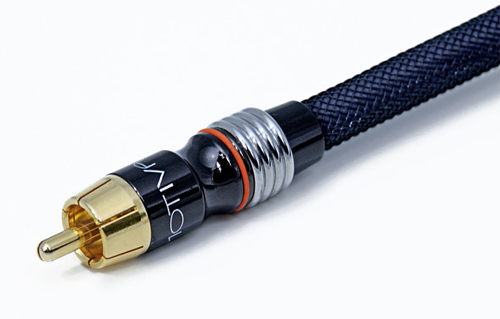 Soldered ends of the cable are covered with an injection-molded subchassis to provide a durable, corrosion-resistant, lifetime connection. Dual-twisted, 10 gauge, high strand count oxygen-free copper conductors. Interchangeable tips: banana plugs or spades (4 of each included with every cable). Diecast, non-ferrous metal alloy breakout collar for added support. Emotiva has more, X-Series IEC Shielded Power Cable, X-Series HDMI Cable, X-Series Optical/Toslink Cable, X-Series Component/Video Cable, X-Series Digital/Coaxial Cable. Check them out here.